My earliest footballing memory is that of France 1998. There was something about that tournament that satiated my curiosities about the sport and drew me in. One of the first teams I had the privileging of watching involved the Red Devils of Belgium. For a 7 year-old kid, their fraternal strike duo of Emile and Mbo Mpenza were the epitome of cool. But it was another striker that remained engraved in my memory ahead of Brazil 2014: Marc Wilmots. In truth, I only remember him because I was terrified of him. Against Mexico, Wilmots scored two goals and he wasted no time dallying about for either. I exaggerate not, he scored his first World Cup goal by latching onto an inswinging corner and nutmegging eccentric Mexican keeper Jorge Campos with his clenched abdomen. At home, I held my abdomen in vicarious pain, but the skin-headed Wilmots just roared in celebration. 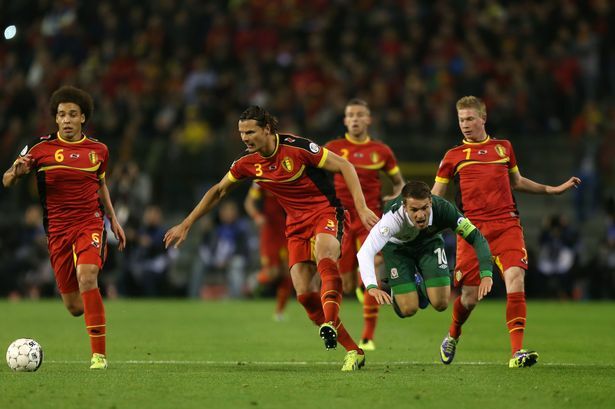 A little later, Wilmots doubled his tally in similar bulldozing fashion. The #7 picked up the ball 25 yards out, dribbled past one defender, through another, before prodding it past Campos. His determination, size, and strength both fascinated and terrified me. Wilmots returns to the World Cup as the head coach of a talented Belgian national team. As good as they were through the qualification campaign, the Red Devils remain a relatively unknown quantity. They were expected to qualify from a challenging group and, to their credit, they did so. On paper, Belgium remain one of the strongest sides in the tournament. The guile and panache of Mertens, Dembele, Mirallas, Eden Hazard; the industry of Witsel, Defour, Nainggolan, Fellaini; the pace and power of Lukaku and Benteke render Belgium an attacking force to be reckoned with. Pundits have asked questions of Belgium’s full-backs and rightly so. They have had to resort to centre-halves deputising on the flanks and have suffered because of it. MSN UK has specified defending from wide areas as an area Belgium could be vulnerable from. What’s certain is that the vast majority of the Belgian squad are quite young and they will need every ounce of experience from players like Van Buyten and Timmy Simons and all the grit of a throwback Marc Wilmots to ensure they remain concentrated for their first World Cup this century. World Cup 2018 hosts Russia topped a group that contained Ronaldo’s Portugal to make it to Brazil. More impressively they managed it with a wholly domestic squad, the only European side to do so for the 2014 qualifiers. The Russian lads will be a tough assignment for South Korea and Algeria, but not unbeatable as we will see. After failing to make the last World Cup in spectacular fashion against Slovenia, the Russians brought in former England manager Fabio Capello and he has managed to steer them through a tough qualifying group to avoid the potential pitfall of a play-off loss. They will be looking to put in a good showing before it’s their turn to host the tournament. The Russian side boasts the likes of the dangerous Kershakhov in attack and the reliable Akinfeev safeguarding their nets. Whilst they did have a decent qualifying campaign, they are very prone to a good old wobble, losing 1-0 away to Northern Ireland and drawing 1-1 away to Azerbaijan as nerves overcame that in that final game. Their 100% home record was what really got them over the line, something they obviously won’t have in Brazil. If you like to think of Russian teams being “compact” and “well disciplined”, then you probably wouldn’t be far wrong in that assessment. Whilst the reliable Alexander Kershakhov bangs the goals in, their defending is solid, they let in just 5 goals throughout their qualifying campaign. However they do lack a creative element in the middle of the park, and this is their limiting factor. If South Korea manage to cut off Kershakhov in their opening game they could have the upper hand (The two teams met in a pre draw friendly in November which ended 2-1 to the Russians, but none of the goals in that one were of high quality and neither was the game, which was played in the UAE). That would put Russia under severe pressure as they have to play the impressive Belgium in their second game before facing Algeria in the final game. It’s interesting to note that their 2002 WC group was very similar, comprising of Japan, Russia, Tunisia & Belgium. This trivia of course will bear no consequences. But Russia did fail to make it out of their group that last time round…just sayin’. Algeria have qualified for their second consecutive World Cup tournament; a feat which hints at a spell of consistency and competence. But Vahid Halilhodzic’s squad will probably not resemble that of 2010. The Warriors of the Sahara have undergone a makeover. Shortly after the disappointing performance in South Africa, Algeria’s spiritual uncle Rabah Saadane resigned as coach of the national team. A short period of instability, and Algeria failed to qualify for the 2012 African Cup of Nations. Algerian FA President Mohamed Raouraoua scoured the footballing plains for a competent manager and finally decided on Vahid Halilhodzic. The Bosnian manager is a francophone and boasts a wealth of experience in both Africa and in Europe. It would prove to be an inspired and decisive appointment. That regeneration would take its toll as Algeria missed the 2012 edition of the Africa Cup of Nations. But the sacrifice has ultimately paid off as Algeria strolled through a thorny qualifying group unharmed. They were then paired with African Cup of Nations finalists Burkina Faso. The two legs were tight-knit affairs, but the Algerians deserved their qualification. Captain Madjid Bougherra bundled the ball over the line after a botched clearance from ricocheted off of his face. Coach Vahid’s Algeria could cause problems in Brazil. The Bosnian implemented a new system of play. It’s always an offshoot of a 4-3-3 (Sometimes a 4-2-1-3, but mostly a 4-1-2-3). His teams adopt an aerobic style, often outrunning and out-hustling the opposition. The two attacking wingers are usually a goal threat. In fact, 11 of 16 goals in qualification were scored by the front 3 for Algeria. The team press high up the pitch and like to attack from wide areas. They might not be expected to advance from Group H, but Algeria have all the capabilities to do so. That makes them a very dangerous opponent indeed. The midfield will carry this South Korea team. Ki Sung-Yueng, Kim Bo-Kyung, and especially, Koo Ja-Cheol are all fundamentally sound players who play with much energy and discipline for their respective club sides. On the wings, the likes of Lee Chung-Yong, Lee Keun-Ho, and Son Heung-Min are master dribblers who have pace and are willing to do their defensive duties. One would imagine one of Ji Dong-Won, Lee Dong-Gook, or Park Chu-Young will spearhead the attack, depending on form and fitness. One point of contention is the Korean defence which has been found out by many an opposition. The rhythm of the domestic Korean league also factors in the upcoming preparations. The K League finished in late January and will only resume at the end of March. In the off-season, coach Hong Myung-Bo took a squad over to America for three friendly matches. They tied Costa Rica, but were comprehensively beaten by Mexico and the United States of America. Optimists in the Korean camp pointed to fatigue that accompanies comes with the end of league play. Pessimists were frustrated with a porous defence which continued to leak goals. One advantage the K League might provide the Korean national team is that it’s players, of whom many play in the national outfit, are now off for two months. They will not resume play until the beginning of the March, perhaps providing an opportune resting period before the World Cup and its arduous requirements. The Taegeuk Warriors will need to harness all stores of energy if they are to qualify from such a balanced group.